North Carolina will have another “traditional” Hindu temple in the near future. Ground Breaking Ceremony (Bhoomi Puja) for “Winston Salem Hindu Temple” in Clemmons (North Carolina) was held on June 11; which included pujas, aaradhana, havan, kalasha pradakshina, samprokshnas, etc. Besides worship services, this 3,600-square-foot Temple will also organize festivals, celebrations, special events, etc., and besides sanctuary, will also include classrooms and a community center, reports suggest. 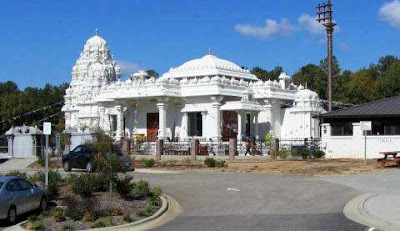 To be built by Om Hindu Organization of North Carolina and Sri Mata Shaktipeetham, 7.6 acres have reportedly been purchased for this purpose. Construction, after consultations with temple architects in India, will start later this year. It plans to have the shrines of Lalithaambika, Kaameshwara, Ganapathy, Balaji, Aditya, Shirdi Sai, Ram Parivar, Radha Krishna, Valli-Devasena-Subrahmanya, Ayyappa, Hanuman, Dhanvantri, and Navagraha; besides a Dwaja Sthambam. Estimated Cost for Lalithaambika shrine at $75,000 is highest among all of the shrines. This will be the first Hindu temple of Forsyth County, where about 500 Hindu families reside. In the absence of a temple, the area Hindus have been travelling to Charlotte and Cary, besides worshipping at home shrines. “A Hindu Temple stands for Tranquility, Education, Meditation, Purification, Love and Engagement”, according to Temple website. Dr. Sudhakar Pandit, Swami Rajendran and Krishna Surabhi are Chairman, Vice Chairman and Secretary respectively.